Karen Schwartz serves as Interim Associate Vice-President (Research and International) and as Carleton’s International Liaison Officer. She reports to the Vice-President (Research & International) and is part of the senior management group responsible for advancing Carleton’s international research agenda. In this role, she oversees the international activities at the university including research and development projects, global partnerships and exchanges, and working with numerous visiting scholars and diplomatic delegations. Prior to coming to the Office of the Vice-President (Research and International), Karen held the position of Associate Dean of Research and International in the Faculty of Public Affairs (FPA) where she distinguished herself with helping to improve the research culture within the Faculty through the FPA Research Month activities and the inception of the FPA Research Excellence Chairs. She holds a tenured position in the School of Social Work at Carleton, which she took on in 1999. Her academic record includes an impressive number of well-cited publications, community-campus research collaborations and the instruction and supervision of students in community-based research. Her research interests lie in community-engaged scholarship and research, specifically in the mental health needs of multi-cultural groups and international social work practices. She received invaluable international experience as a Visiting Scholar, Professor, and Expert in China, Austria and Finland; and as co-author on several publications on international social work projects. She has also partnered on a number of international grants to support student internships. Prof. Schwartz sits as co-chair of the steering committee for Community First – Impacts of Community Engagement (CFICE) a SSHRC funded Partnership Grant, and is a Board member with Community Based Research Canada (CBRC) and with the South East Ottawa Community Health Centre Ethics Review Committee. 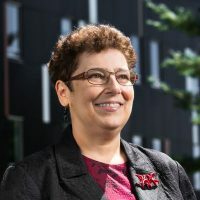 Prof. Schwartz has served on many other boards and committees in her career, notably the International Association of Schools of Social Work (IASSW), and as the representative for Carleton University with the Federation for the Humanities and Social Sciences.